UNITED NATIONS, United States, May 28, 2018 (BSS/AFP) - The United States has asked the UN Security Council to add six South Sudanese officials including the defense minister to a sanctions blacklist for fueling the country's war and blocking aid, according to a draft resolution seen by AFP on Sunday. The six would face a global travel ban and assets freeze if the draft resolution is adopted at a meeting scheduled for Thursday. 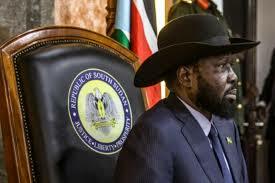 The council will meet Tuesday to discuss the US sanctions proposal that comes as Washington has grown increasingly frustrated with President Salva Kiir's government. Countless efforts have failed to bring peace to a country now in its fifth year of a war where targeted ethnic killings, gang rapes and other atrocities have occurred. The proposed sanctions blacklist would target Defense Minister Kuol Manyang Juk for violating the latest ceasefire signed by the government last year and for leading attacks on the northeastern town of Pagak that was captured from rebel forces in 2017. Also listed is cabinet minister Martin Elia Lomuro for threatening the press, obstructing humanitarian aid and impeding the work of the UN peacekeeping mission in South Sudan. Information Minister Michael Makuei is cited for his role in planning an attack in 2014 on a United Nations compound in Bor and overseeing a campaign to suppress the media. Former military chief Paul Malong faces possible sanctions for ordering government forces to attack civilians, schools and hospitals and deputy army chief of staff Malek Reuben for overseeing an offensive in 2015. The proposed sanctions list also includes Koang Rambang Chol for leading attacks in northern Bieh state and ordering his forces to impede the work of aid workers, according to the draft. The draft resolution would also extend the sanctions imposed on South Sudan for another year and renew the mandate of a UN panel of experts. There are currently six names of senior generals and rebel commanders on the UN sanctions list. In the years since, millions have been uprooted, triggering a regional refugee crisis, and millions more have been pushed to the brink of starvation, while tens of thousands have been killed. Ethiopia is leading a regional peace effort, hosting talks between the government and rebel groups but there has been no breakthrough.